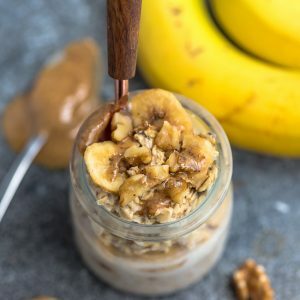 Banana Nut Overnight Oats an easy make ahead gluten free breakfast for busy mornings on the go. Only 5 minutes of prep time made with hearty oats, bananas and crunchy walnuts. Add oats, milk, chia seeds,(and sweetener if desired) together in a mason jar, resealable container or a bowl. (If you like your oatmeal more creamier, you can add more milk and less if you like them on the chunkier side - you can also add an extra 2 tablespoons yogurt (dairy free if needed) to make them creamier). Add mashed banana, cinnamon and sweetener, if using. Serve with more milk as desired and top with fresh banana slices and walnuts before serving, if desired.